At Visions, we understand that money matters to people. And people matter to us. One of the most vital parts of any community is it’s people — that’s why we give back in so many ways. As a credit union, giving back is what we do. Our members give us the fiscal strength and support we need to make a difference. We, in turn, give of our time and talents. At Visions, we love to give — and not just money. 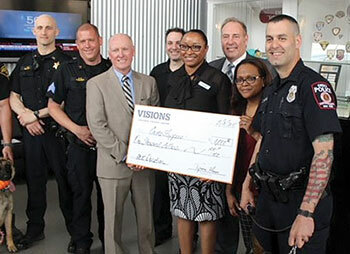 Visions Cares was created to celebrate all our organization does to help make our communities and each other better. Some of our favorite causes involve those fighting poverty, eliminating hunger, improving schools and education, sparking economic growth, supporting physical fitness, or promoting financial health and wellness. Every year, we donate over $1 million to causes and organizations throughout our three-state footprint. Our employees donate thousands of hours of their time too, volunteering for causes that matter to them. We couldn’t be prouder of their efforts, and we take every opportunity we can to recognize them and reward them for it. Employees also support a Denim Days program that lets them donate $5 to wear jeans on Fridays. Proceeds benefit a different not-for-profit each month, which totals over $40,000 a year! Voluntary payroll deductions add another $120,000 a year that benefits the United Way. Employee-led fundraisers like walks, craft or baked goods sales, and food drives have an impact of nearly $35,000. Sponsorships can range from being the title sponsor of a cooking competition benefiting a local food bank to a program ad for the high school musical. The funds raised tend to help support an organization’s general fund, or “bottom line.” We sponsor events covering many causes across all of our regions. Grants are donations tied to a specific project that have a measurable impact on the organization or community. Organizations request grants to cover specific programming, pieces of equipment that enhance their provided services, and more. It’s not always money that’s needed to make a community event memorable. Visions can also help provide the finishing touches with donated items such as pens, water bottles, gift cards, and more. Employee volunteerism is a big part of our corporate culture. The Community Impact Program allows employees to log their volunteer hours — for all events, not just those sponsored by Visions — and then earn rewards based on their participation hours. Employees routinely donate more than 3,000 hours in a year. Need a hand at your organization- either for day to day operations or your next event? Apply for help from Visions volunteers. Abilities of Northwest Jerey, Inc.
BHS Football & Cheerleading, P.A. Broome County Auto Dealers Council, Inc.
Broome County Firefighters Association, Inc.
Chenango County Sheriff's Employees Association, Inc.
Chenango Memorial Hospital Foundation, Inc.
Council of Irish Association of Greater Bergen County, Inc.
Morris County Council of Education Associations, Inc.
Morris County Retired Educators Association Philanthropic Fund, Inc.
Passaic County Education Association, Inc.
Promo One of NJ, Inc.
Spencer-Van Etten Alumni Association, Inc.
Syracuse Automobile Dealers Association, Inc.
Tennis Charities of Binghamton, Inc. The Bandera Family and Community Alliance, Inc.
Zonta Club of Northern Valley, NJ, Inc. Visions took its sponsorship a "step" further by assembling its own team, which raised several thousand dollars as part of the Making Strides Against Breast Cancer Walk benefiting the American Cancer Society. There were prizes for the top three runners overall and within each age category and a raffle held for those who attended the Fourth of July run filled with food and entertainment. Visions also made a $2,500 donation to the John Mack Foundation, which goes toward putting defibrillators in select locations across the Southern Tier. As a result of a staff Denim Day, Visions employees raised money to benefit Center for Prevention & Counseling’s services located in Newton, New Jersey. 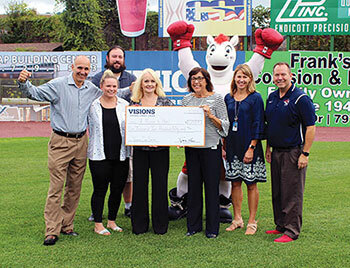 Visions hosted a tournament between the minor league baseball's Reading Fightin’ Phils and Binghamton Rumble Ponies. We gave away free tickets to members, who watched the two teams tie. The money was split between two organizations as the Rumble Ponies sponsored A Room to Heal and the Fightin’ Phils sponsored Baseballtown Charities. Employees from all three states donated money during an Employee Picnic and Denim Day. The funds were then given to the Food Bank of the Southern Tier to help feed families in the community. Our educators give so much to their kids and our communities. The Visions Loves Educators Classroom Program is just one small way we can give back to them. Each year, Visions awards full funding to projects submitted by educators at the elementary, middle, and high school levels in our New York, Pennsylvania, and New Jersey communities.